Squirrels like to chew on your wood siding because their teeth are constantly growing. They need to file their teeth down. If you have easy access for a squirrel to get to your wood siding, then he will find it to be the perfect place to trim down his teeth. This can cause damage to the house and leaks and can keep you from sleeping because squirrel chewing is a loud noise. There are a few steps you can take to keep squirrels from doing this. With your hedge clippers, cut back any trees or bushes that give squirrels access to your house. Put porcupine wire over the areas that the squirrels usually sit. This will keep them off the ledges they are used to when they are chewing on your siding. 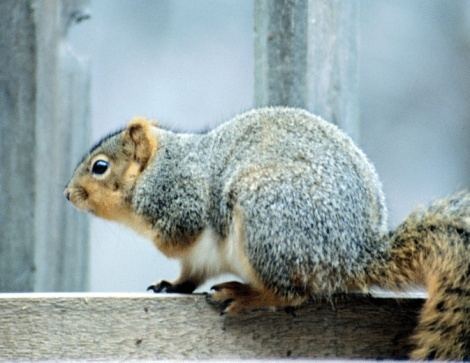 Spread a tactile repellent like "Birds Away" on the areas the squirrels chew on. Squirrels don't like getting the thick sticky material in their fur, so this will add to the deterrence. Spray a taste deterrent like "Ropel" on the house siding. This will make the wood taste bad, and the squirrels will eventually stop trying to chew on the house. Be sure to reapply after a hard rain. Apply roofing cement to areas where the squirrels chew. They won't like the taste of the tar, and it will keep them from chewing. Lisa Rusczyk is a novelist and freelance writer living in North Alabama. After several years in the live sound business, she worked as a programmer and proofreader. She studied English at Auburn University and audio engineering in Tempe, Arizona.